People all over the world are embracing online dating as a viable way of finding love and establishing meaningful relationships. However, it has become a major challenge for some people to utilize the benefits of online dating due to racial differences and conflicting cultural beliefs. To address this challenge some dating websites have introduced dedicated online portals to facilitate the matching of like-minded singles who share a common background and cultural beliefs. One dating platform that has been successful over the years with this model is EliteSingles.com. EliteSingles is an online dating service that operates in over 20 countries worldwide, with over 13 million registered members. They pride themselves on creating about 2000 couples every month. However, what makes EliteSingles unique is not the large user-base or their unrivaled matchmaking abilities but on something else very different. Dedicated to matching compatible Asian singles in Europe, America and other English-speaking countries that EliteSingles has a presence. The idea of an Asian Dating site was conceived because of the great influx of Asian arrivals to Europe and the U.S. as either immigrants, students or professionals. This opened an avenue for Asian singles to meet and interact with either fellow Asians or other like-minded singles from other races. Then you will need to go into details about yourself, with information such as religion, background, temperament, key personality traits etc. Some of the queries will require self-reflection while others might not. The final section of the process is all about your potential match, here the queries will try to dig deeper on the kind of person you are interested in meeting. What key personality traits should they possess, what hobbies and interests, how about their social lives such as drinking and smoking habits, with children or not etc. Note: EliteSingles manually review and approve every application request from interested users. The site goes into detail on the specifics such as the use of SSL-encryption that guarantees safety of your personal information; Firewall to protect information from unauthorized access; and integrity of the team that will handle your personal information. EliteSingles website design makes using the site easy. Every detail is well organised on the page. There is a small rectangular box on the right side of every page that you can use to GET STARTED by signing up. Apart from that, there is also an EliteSingles help center page with a search box at the top, where you can enter any word or sentence relating to an issue you are experiencing such as; How do I delete my profile? How do I cancel my subscription? The system will automatically provide a series of preloaded instructions to help you address the issue. Editor’s Verdict: Should you sign up? There are hundreds of online dating websites in the internet; sometimes, it might be a bit difficult to choose which platform is right for you. 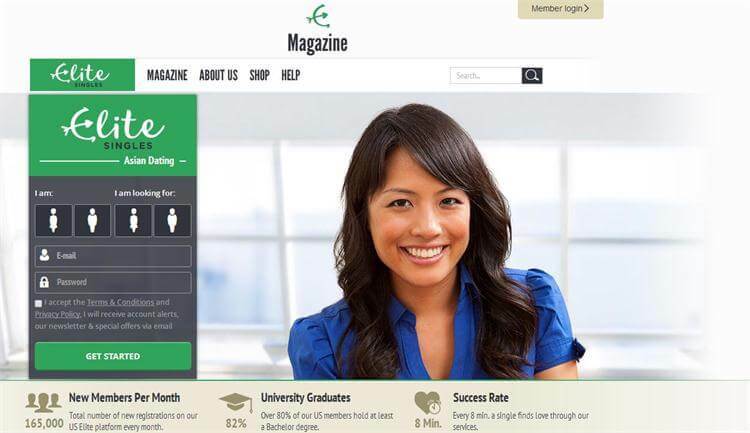 However, when it comes to Asian Dating no website comes close to EliteSingles.com. They have designed a platform that has provided a perfect avenue for singles with an Asian background to find love and be a part of the online dating revolution. There is no better time than now. Sign up and get started on your search for love.